Considered the most avid Bauhaus proponent in the United States, Irene Rice Pereira’s oeuvre reflects her commitment to machine-age materials and a philosophy that called for a merging of technology and the transcendental. (Smithsonian Archives) Her works emphasize the importance of light, space and its continuum; ideas inherent throughout Pereira’s entire oeuvre. As a founding member of the Design Laboratory in New York, which encouraged experimentation with all art forms and mediums, Pereira was also an early member of the American Abstract Artist’s, a group dedicated to the promotion of abstract art. She created her first glass painting in 1939. The illusionistic three-dimensional quality of these works on glass created a responsive and independent movement between light and color; a transcendence of space. 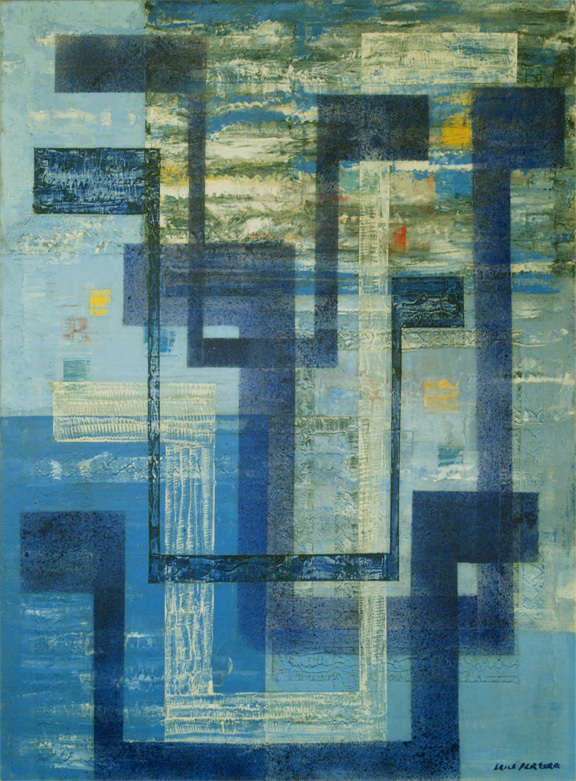 Pereira’s works from the 1950’s and 1960’s are her most comprehensive and successful attempts at creating works which were both technically satisfying and philosophically transcendental. Works from this time period represent Pereira’s newly developed vocabulary, one in which geometric symbolism is used in place of visually interpretable objects; The tripartite represents the earth, the sky and the infinite space in between (also known as the light penetrating space); the periscope-shaped symbols represent the infinite expansion of the mind; and the yellow square, in the middle, represents the lapis, or philosopher’s stone, a source which would bring enlightenment upon the maker. Pereira’s unique voice and style earned her major retrospectives at the Museum of Modern Art in 1946 and the Whitney in 1953. After the closing of her 1953 retrospective, Pereira became extremely vocal about her assertions that the museums were systematically suppressing her work; a similar claim made by the Irascibles only three years earlier. In addition she fervently published her criticism of the Abstract Expressionists, a position which slowly alienated her from her peers, the dealers, the institutions and ultimately the entire art world.